 Public Lab: How to use Alkaline Batteries with the Riffle? Question: How to use Alkaline Batteries with the Riffle? How do you use readily available batteries with the Riffle? The current version of the Riffle (v1.18) usually ships with a 3.7 V rechargeable lithium battery with a JST connector, like this one. 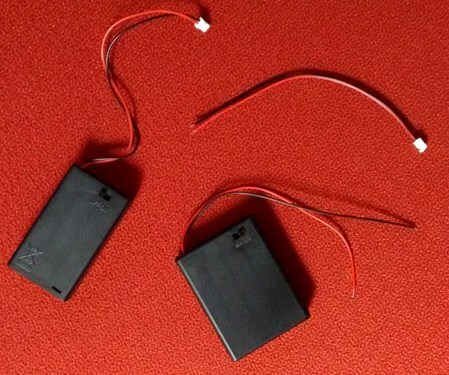 But since lithium batteries may not be available everywhere, and are difficult to send through Air Mail, the Riffle was also designed to be compatible with any type of battery chemistry, as long as it uses a JST connector and is at the right voltage. What do you need to know to use other batteries with the Riffle? What are the voltage requirements: are there upper and lower limits? How many AA/AAA equivalent batteries do you need to use, and can those be rechargeable? Can commercial lithium rechargeable batteries like these be charged from the Riffle's JST circuitry? How does JST work with conventional batteries? What are the easy methods and expert methods to attach JST connectors to batteries? @warren is the question:question tag necessary? And was there a recent change with the editor? The new editor seems to be fighting with the old one. The silkscreen on the Riffle says 3.5v to 6v for the "general" power connection. That's different from typical 328p Arduinos (e.g., Uno, Nano) which can be powered by 7v to 12v. Maybe @donblair can confirm the range (oops, he won't see this because this is not a comment). So assuming 3.5v to 6v, the Riffle can use four AA or AAA batteries. Four alkalines would supply 6v, and four rechargeable NiMH (e.g., eneloop) would supply 4.8v (when the batteries are fresh). Don't know. Those require a special size battery case -- they are not AA or AA. You might want a dedicated charger. You can buy battery cases for AA and AAA batteries with JST connectors. For the Riffle you want JST ph 2-pin. It might not be easy to find a four battery case with a JST ph 2-pin connector. But cases are just a couple of bucks and JST connectors are cheap too. Above: Case for three AA batteries with JST ph 2-pin connector from Adafruit (left), case for four AA batteries from eBay (no connector) and a wired JST ph 2-pin connector which can be soldered on (right). I bought some JST ph 2-pin connectors but they don't quite fit in the ones on the Riffle. It was easy to shave the plastic so it fit. You can buy a few here. Thank you for this informative answer! I have a few followup questions. On the adafruit description for their 3 x AAA enclosure, they say that it is a good stand-in for their 3.7 V lithium battery, with estimates of a voltage ranging from 3.7 V for fully charged NiMH batteries to 2.7 V at their end-of-life. Would it be safe to use the Riffle in this configuration, or would the Riffle start to suffer when the battery voltage dips down past 3.5 V? E.g. does the silkscreen label refer to nominal voltage, or actual voltage? Maybe we don't know yet, and have to characterize the riffle's performance still. Also, 4 x AA or AAA batteries would give a voltage of 6 V, which is right at the Riffle's stated upper limit. I assume that higher voltage than this could be dangerous for the riffle's electronics, but 6 V would be safe, and perhaps the longest-lasting option for battery life? I don't know how low the voltage has to get before the Riffle starts to misbehave. @Donblair designated the 3.5v to 6v range, so he must have based that on something derived from truthiness. There must be a similar range for the lithium battery circuit. I don't know why one has a range and the other does not. Three fresh alkaline AA or AAA can provide 4.5v or a little more. Some NiMH rechargeables are 1.3v apiece, so three fresh ones would provide at least 3.9v. I don't know how sensitive the Riffle lithium circuit is to greater than 3.7v. I'm sure Don has some related wisdom. It might be a critical safety issue that alkaline batteries should not be on a circuit that can provide charging power back to the batteries when the Riffle is plugged into USB power. You will have to promise never to plug in the USB cable when something other than the appropriate rechargeable battery is on that circuit. I think that is a good assumption that starting with 6v (the top of the range) will provide greater endurance than staring in the middle of the range, all other things being equal. But lithium is not really equal to alkaline or NIMH. The battery chemistries differ in their ability to hold a charge when not in use (e.g., when the Riffle is sleeping during long deployments). I have a few nice battery cases for four AA, so I added them at the KAPtery. You can now buy a case and three male-female pairs of JST connectors for $9.00 delivered. The case has an on/off switch. Regarding using a battery with voltage near the top of the acceptable range, apparently some voltage regulators convert the voltage to the desired level and waste the rest as heat. So unless you know how the circuit is built it's hard to know without testing whether higher voltage batteries will last longer. What would be a good basic activity to test out a data logging device in water?